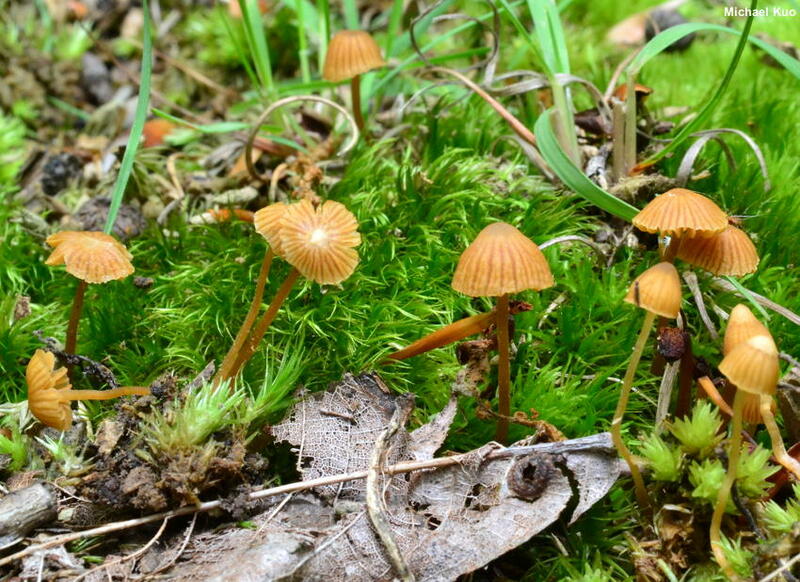 This is the most common Galerina species in my area (central Illinois), where I find its tiny caps rising above moss beds from May to September. 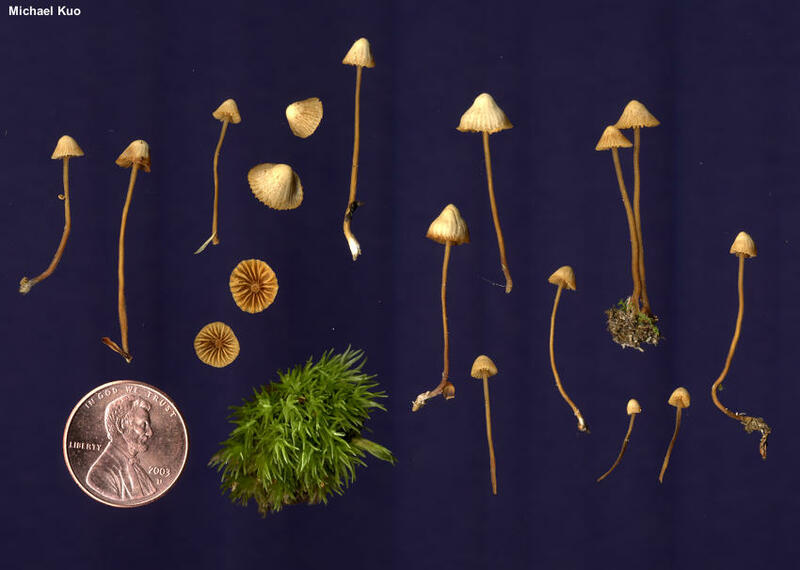 It features a stem that is adorned with tiny whitish flecks and fibrils, a prominently lined cap, and lacks a distinctive odor. Many species are more or less identical to the naked eye, however, so microscopic examination is required for certain identification. 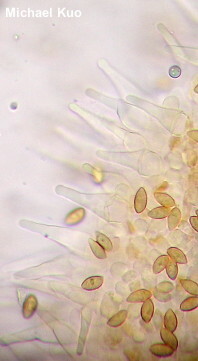 Galerina vittiformis features large, long-necked hymenial cystidia, finely verrucose spores, and a cap surface that lacks cystidia. 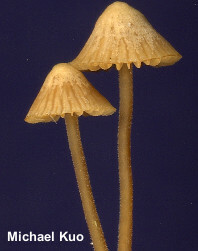 There are two forms of Galerina vittiformis—one with 2-spored basidia (featured here) and one with 4-spored basidia that produce slightly smaller spores, Galerina vittiformis f. tetraspora. 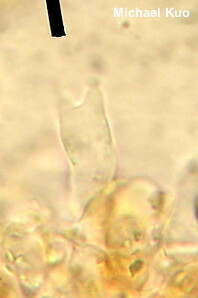 Galerina atkinsoniana is a very similar species that features cystidia on the cap surface. According to Gulden (2010), "[s]everal species and many varieties and forms have been described in the vittiformis complex which is badly in need of revision." Galerina vittaeformis is an alternate spelling. Ecology: Saprobic; growing alone, scattered, or gregariously in moss; summer and fall; probably widely distributed in North America. The illustrated and described collections are from Illinois. Cap: 2–6 mm; conic at first, becoming broadly conic or convex; dry; bald; medium orangish brown to dull brownish; fading markedly as it dries out, creating a two-toned appearance; the margin lined, almost to the center. Gills: Narrowly attached to the stem; nearly distant; short-gills present; colored like the cap. 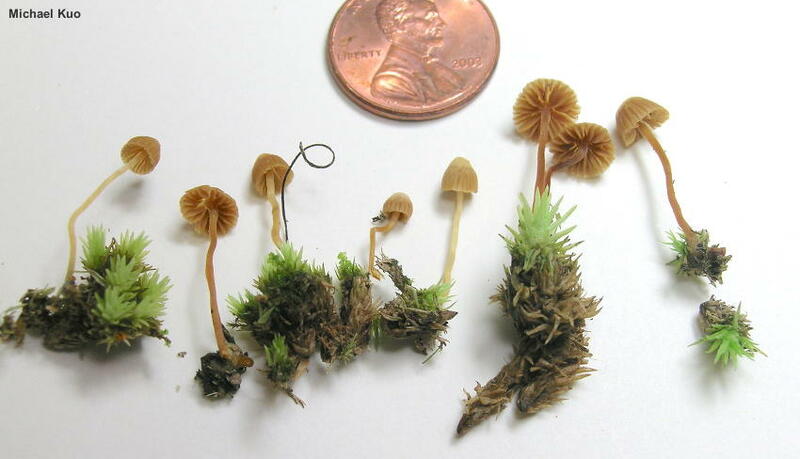 Stem: 7–35 mm long; 0.5–1 mm thick; more or less equal; fragile; dry; when fresh adorned with tiny fibrils; whitish to yellowish above, brownish below; basal mycelium white. Flesh: Insubstantial; unchanging when sliced. Chemical Reactions: KOH negative to reddish on cap surface. 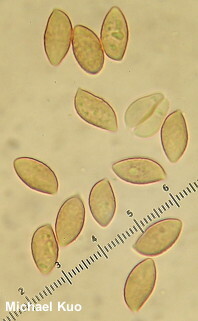 Microscopic Features: Spores 9–13 x 6–7 µm; subamygdaliform to widely subfusiform; verruculose; orangish brown in KOH; dextrinoid. Basidia 2-sterigmate. 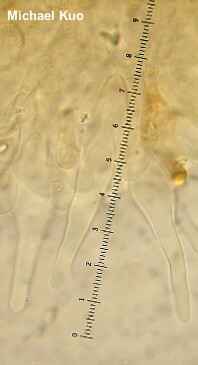 Pleurocystidia and cheilocystidia 40–75 x 5–15 µm; lageniform, with a long neck and a rounded, subacute, or subcapitate apex; smooth; thin-walled; hyaline in KOH. Pileipellis a cutis. Clamp connections present. REFERENCES: (Fries, 1838) Singer, 1950. (Smith & Singer, 1964; Breitenbach & Kränzlin, 2000; Gulden, 2010; Desjardin, Wood & Stevens, 2015.) Herb. Kuo 06160301, 05040701, 06041301.